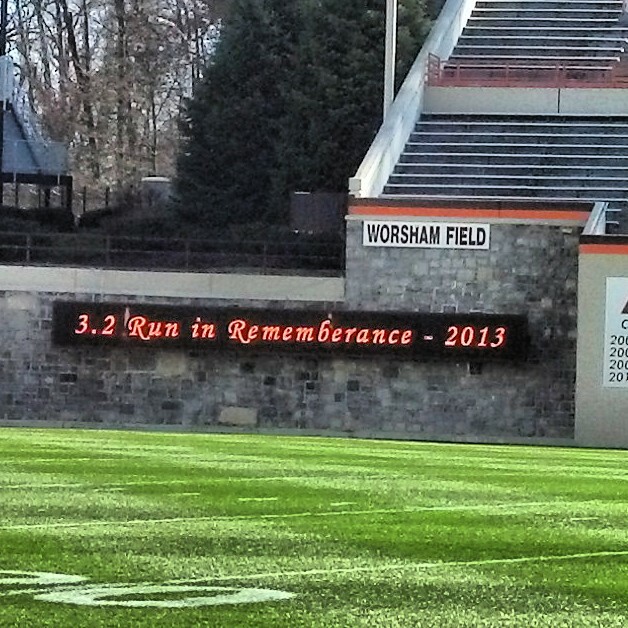 Today I ran the 3.2 for 32 Run in Remembrance. This was the fifth year for the race, and I have been fortunate enough to get to participate in it every year since it started. This is a special kind of race. It is held as part of the Day of Remembrance memorial activities to remember and honor the victims who lost their lives on April 16, 2007. The race is free to all participants, and the first 4,000 or so get a free t-shirt. They also hand out bibs, but there are no bib numbers. 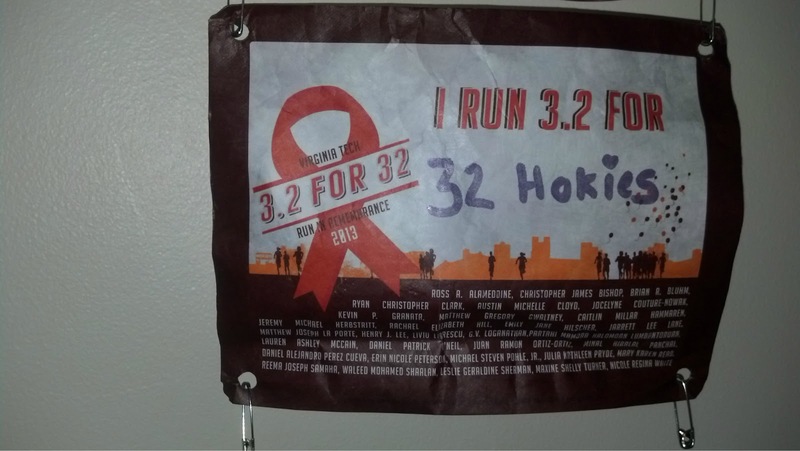 As you can see in the above picture, the bibs say “I Run 3.2 for” and then there’s a blank space for you to fill in the name of a person you are running in memory of or what you are running for. Before the start of the race, my Dad and I got to meet up with Debbie from Deb Runs. We chatted for a bit before the start and I also got to meet her husband, her son’s girlfriend, Julie, and two of Julie’s friends Becky from Running on Happy and Kelly from Life With a Side of Coffee. I actually ended up running the race with them, which was a lot of fun since we got to talk and get to know each other even more along the way. It was great to get to meet up! The race is untimed and has an unconventional start. 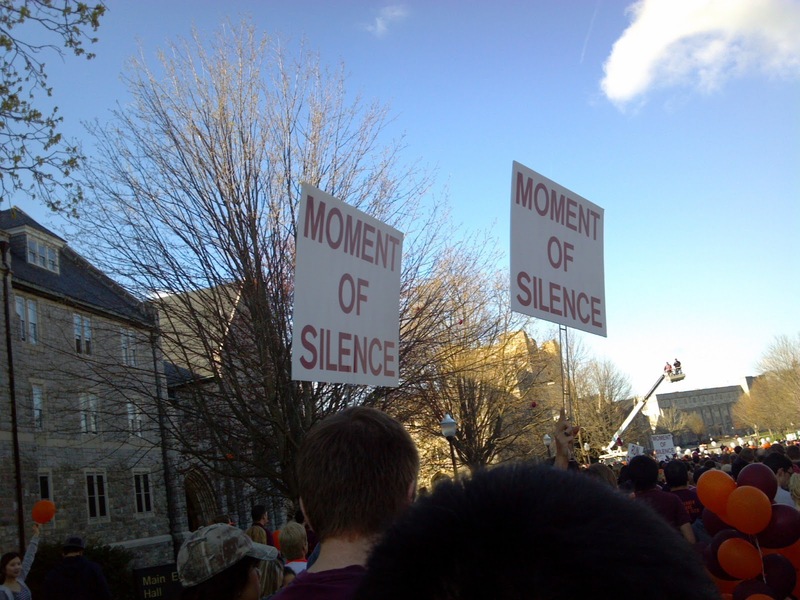 Once everyone is lined up at the start line, volunteers raise signs in the air that say “Moment of Silence”. This indicates the beginning of the moment of silence. 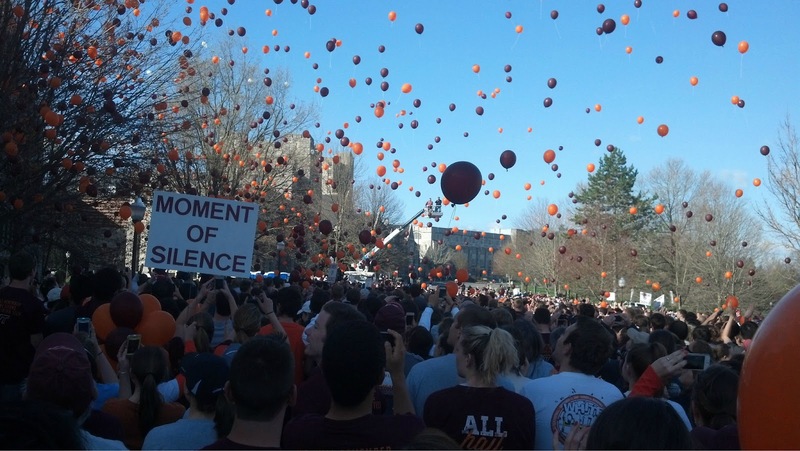 The beginning of the moment of silence is also when 32 white balloons are released into the air, representing the victims. At the end of the moment of silence, the volunteers turn their signs to the other side, which reads “Run Safely”, which indicates the start of the race. 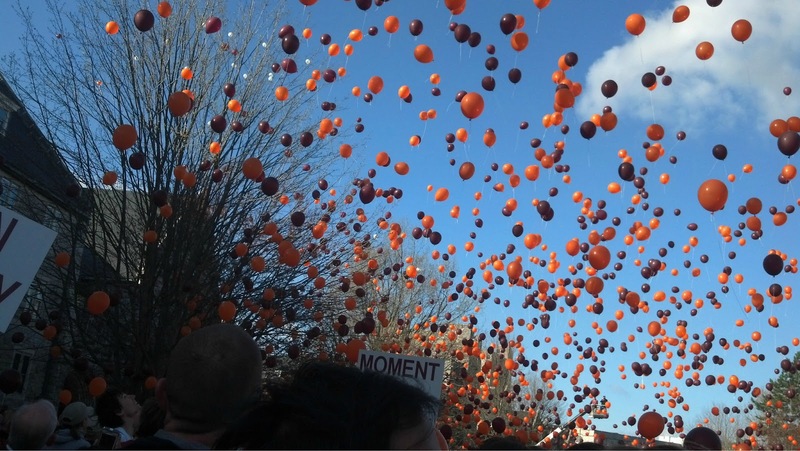 Once they turn their signs, the participants release their maroon and orange balloons and everyone starts running. We didn’t realize we were so far back, and we had to run pretty slow at the start. We also got stuck at a few bottlenecks along the way. Guess we should have started a little closer to the front! 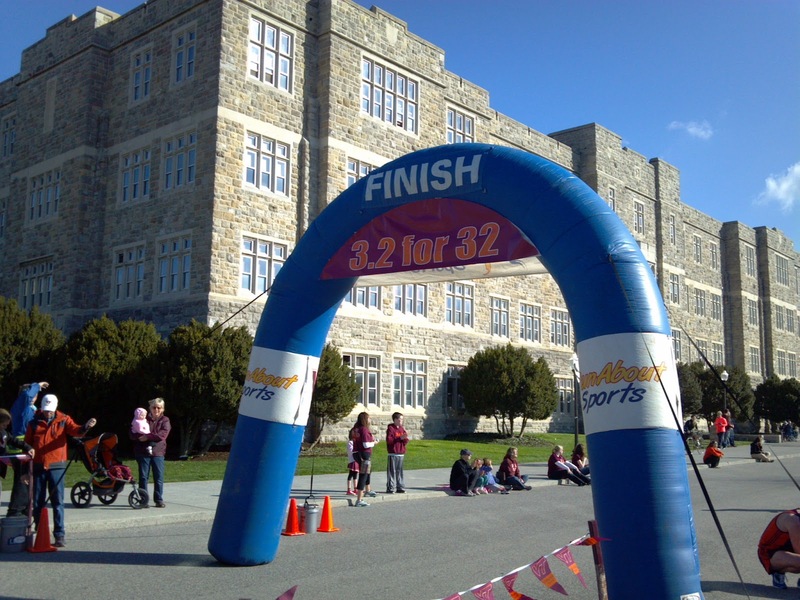 The race snakes through campus, and you get to run through the tunnel onto the football field. We had to wait in line about 5 minutes or so to do this, but it was worth it. 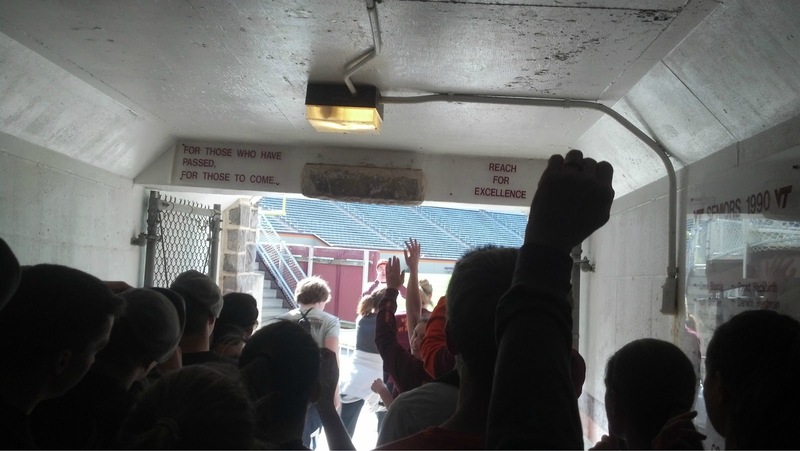 The football players jump up and touch the “hokie stone” before running onto the football field. The signs on either side of the stone say “For those who have passed, for those to come” and “Reach for Excellence”. 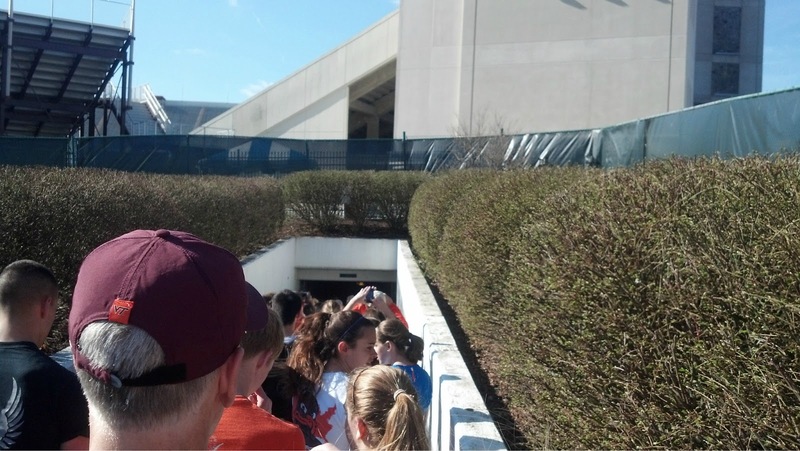 Once we were through the tunnel we got to run across the football field. 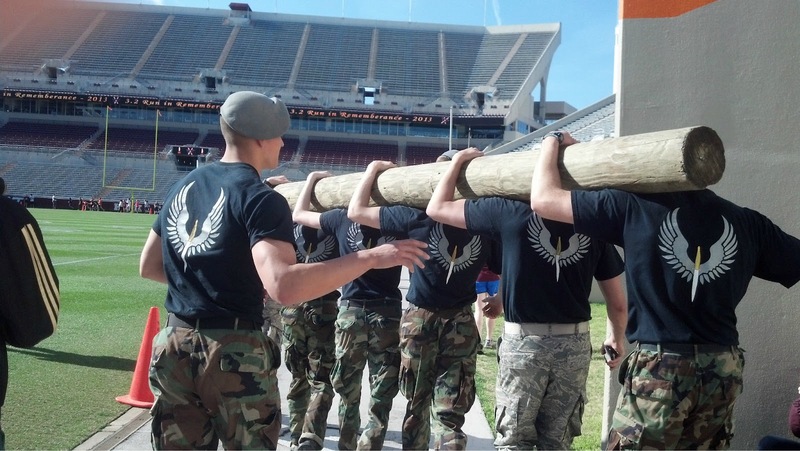 We saw these cadets carrying a pole while we were waiting in line to go through the tunnel. They were running the race while carrying this thing! And of course they were in boots, too! Once we were through the football stadium we started to make our way back to the drillfield for the finish. So glad we were able to tag along to your meet up!! It was really nice meeting you and it was fun all running together! I agree 100% with you that it’s the best foot entrance 😛 Good luck at Blue Ridge! It was nice to meet you, too! Good luck to you at Waynesboro! 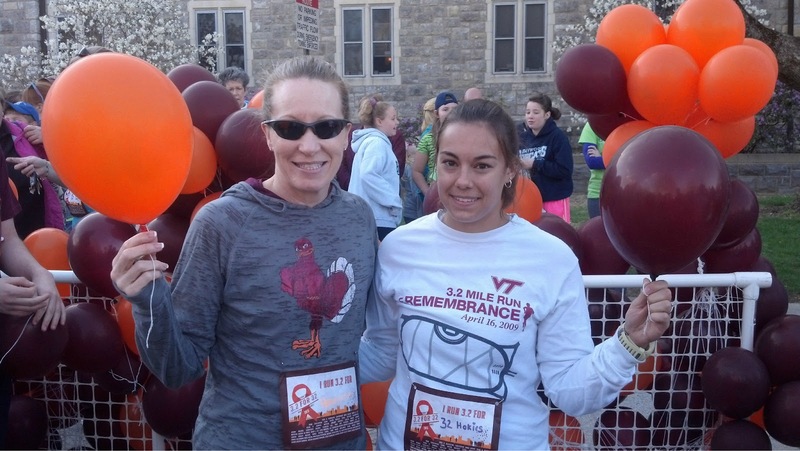 Sounds like you had a great race, and what a great cause this is to support! 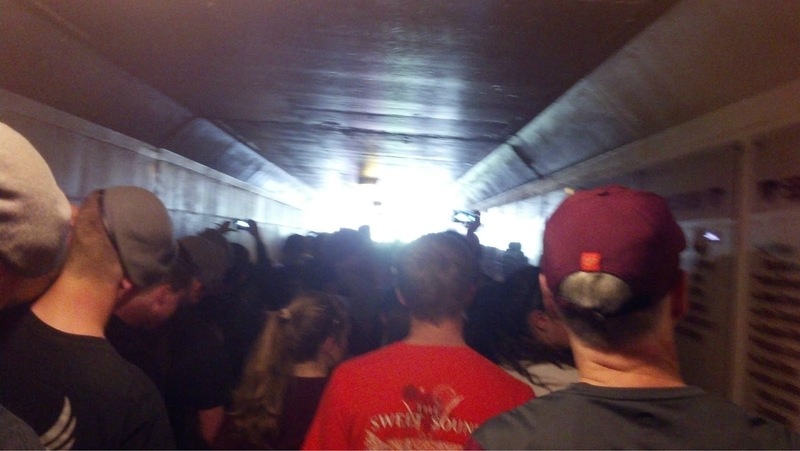 I think it’s very cool that you got to run through the football tunnel there. 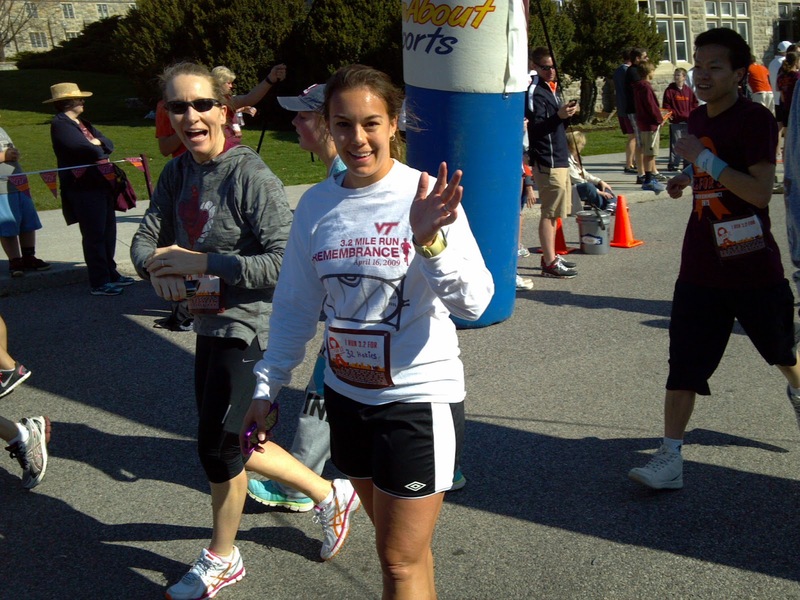 Running through the tunnel was definitely the highlight of the race! It looks like such a special event. I’m glad you were able to take part in it. Your pictures are amazing! It’s definitely a race that’s close to my heart. I hope to continue to run this race year after year, as long as I’m able. The balloons are amazing to see in the sky. What a special event. 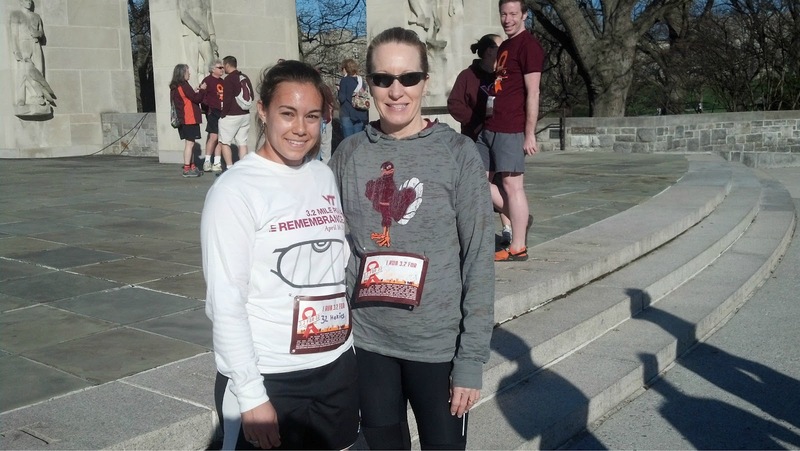 It was great to get to meet up and run with Deb! The balloons are really something to see. They get a “birds eye view” picture of it from that cherry picker that you can see in the picture. It’s usually posted on the race website, and it looks really cool because you’re also looking down on all the race participants. It was great meeting you and running together! I’m just really glad we weren’t the ones carrying the log. Good luck running Blue Ridge next weekend!! You, too! Haha that would have made the race a lot more challenging! Have a great race in Waynesboro! From something so terrible this is a great way for everybody to get together and remember those that lost their lives. Glad there was such good weather for the run. I agree, it’s a great event and the weather was perfect! What a wonderful was to remember. I love the sense of community. I’m also so glad you got to meet Deb and made some other running friends!